Free Shipping Included! 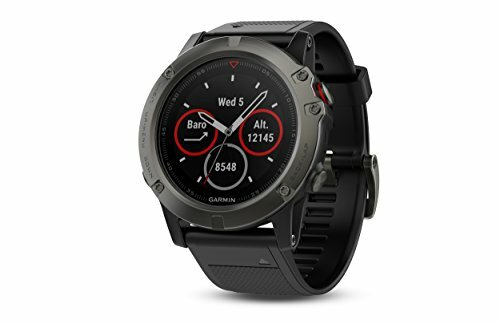 Garmin 010-01733-01 1.2'' Fenix 5X Sapphire - Slate Gray with Black Band (EMEA) by Garmin at iShare Maps. MPN: 010-01733-01. Hurry! Limited time offer. Offer valid only while supplies last. Combining world-class performance with the best features of our fitness and outdoor watches, Fenix 5X is the premiere multisport training companion. Combining world-class performance with the best features of our fitness and outdoor watches, Fenix 5X is the premiere multisport training companion. It’s the first Fenix series watch to offer full-color TOPO mapping for at-a-glance navigation and location reference -so you can beat yesterday, and be sure of getting back. You get advanced features such as Elevate wrist heart rate technology, built-in activity profiles, performance metrics and training status readings that show the fitness-enhancing effects of your workout. Smart notifications help you stay in touch on the go. Plus, Quick Fit bands let you tailor the look to any lifestyle or activity -no tools required. Go from workplace to workout without breaking stride.